Cervical intraepithelial neoplasia (CIN) is dysplasia of the squamous epithelium of the cervix. Most cases of cervical carcinoma evolve from CIN but most cases of CIN do not progress to cervical carcinoma. CIN is caused by infection with the human papillomavirus. Cervical intraepithelial neoplasia is divided into three grades, CIN1, CIN2 and CIN3. These equate to mild dysplasia, moderate dysplasia and severe dysplasia. CIN is not usually associated with macroscopic changes, although abnormalities can be discerned via colposcopy. The process usually affects the transformation zone. The microscopic features are those of dysplasia: the cells of CIN are pleomorphic, hyperchromatic, have a high nuclear : cytoplasmic ratio and increased mitotic activity. There is also disruption of the maturation of the squamous epithelium such that the flattening of the cells occurs higher up than usual in the epithelium. The grading of CIN is based upon the proportion of the epithelium that is occupied by the atypical cells. If no more than the basal one third is affected, the grade is CIN1; if no more than the basal two-thirds are affected then the grade is CIN2; if more than two-thirds of the thickness are affected the grade is CIN3 (typically CIN3 is diagnosed if the epithelium fails to show any maturation). The cytological atypia tends to be more marked the higher the grade of CIN. Koilocytic change frequently co-exists with CIN1 and CIN2. The extent of the atypia usually masks any associated koilocytosis in CIN3. Koilocytes are cells that are infected by the HPV virus. They have squared-off nuclei which are situated in a clear vacuole. Their presence can make it difficult to grade CIN1 and CIN2. Outside the United Kingdom a two tier system is employed: low grade squamous intraepithelial lesion (LSIL) and high grade squamous intraepithelial lesion (HSIL). The former equates to CIN1 and the latter to CIN2 and CIN3. Cervical intraepithelial neoplasia is asymptomatic and is detected via the cervical screening programme. The vast majority of cases of CIN come to attention via the cervical screening programme. 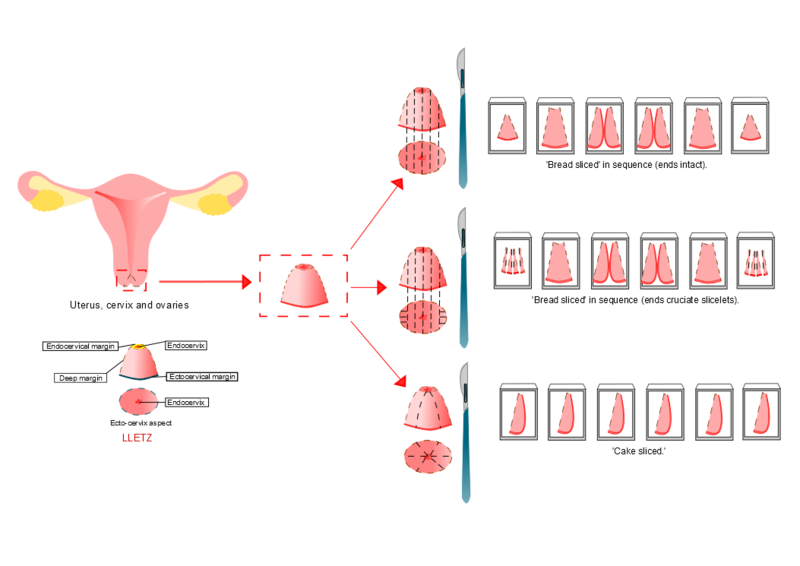 The cervical screening programme involves a cytological sample of the transformation zone being obtained. This procedure is often referred to as a 'cervical smear'. The word smear relates to the previous practice of creating a cytological slide by smearing the cells scraped off the cervix onto the spatula used in the procedure onto the slide. The cytological techniques have now shifted to liquid-based cytology but the term smear is likely to remain due to its previous widespread and longstanding use. The classification of CIN is based primarily on architectural features. A cytological specimen cannot demonstrate these features. Instead, the degree of cytological atypia is gauged and is given the term dyskaryosis. Mild, moderate and severe grades of dyskaryosis exist and tend to correlate quite well with the grade of CIN. If a histological diagnosis is required then either a punch biopsy of the cervix or a LLETZ procedure is performed. Other investigations are not usually necessary. The rationale behind the cervical screening programme is to diagnose CIN at an early stage before it has a chance to progress to squamous cell carcinoma. If CIN of a high enough grade is present then the transformation zone is removed by a long loop excision of the transformation zone (LLETZ). The LLETZ should usually completely excise the CIN if performed correctly. However, removal of the transformation zone can cause cervical incompetence or stenosis. The former can predipose to miscarriage and the latter to obstructive labour. Furthemore, a LLETZ is a surgical procedure and therefore carries a small risk of other complications. Hence it is desirable not to be to precipitous in performing a LLETZ. In general CIN2 and CIN3 are treated by a LLETZ, after colposcopy has been performed; a punch biopsy may or may not be taken before the LLETZ and the LLETZ carried out at subsequent date. CIN 1 is usually managed by an increased frequency of smear taking. Most cases of CIN1 regress spontaneously so a LLETZ is often overkill. However, more frequent smears will allow monitoring of the CIN and enable action to be taken if it persists or progresses. CIN2 and CIN3 also have a significant regression rate but the balance against the risk of progression is shifted in favour of a LLETZ rather than surveillance. Precise guidelines exist in the cervical screening programme as to what action should be taken after any given smear result, or certain sets of results in a ten year period. The lowest level of escalation is to increase the frequency of smear taking. The next level is to refer the patient to colposcopy. Cervical glandular intraepithelial neoplasia (CGIN) is the counterpart of CIN that affects the glandular component of the cervical mucosa. Although low grade and high grade forms have been described it is often suggested that only high grade CGIN can be reliably identified. High grade CGIN requires treatment by excision. Although the cervical screening programme was designed to detect CIN it may also disclose abnormal glandular cells. These cells could have originated from the endocervix but could also be from the uterus or even the ovary. Thus, if glandular dyskaryosis is detected in a smear the patient is referred for a gynaecological assessment, rather than colposcopy alone. The most common specimen for CIN is a LLETZ. This is excision of the transformation zone of the cervix and should be an approximately cone-shaped piece of tissue. A LLETZ has a circumferential margin where the surgical incision has been made through the ectocervix and a longitudinal margin where the incision has been made through the endocervical canal. Opinion is divided as to whether a LLETZ should be inked; those who do not ink state that the diathermy effect denotes the margins whereas advocates of inking suggest that it may be unwise to rely on the discernibility of the diathermy artefact. Opinion is further split as to how a LLETZ should be cut. The objective of the cut up is to obtain blocks that are perpendicular to the ectocervical mucosal surface and which show the ectocervix and the full length of the endocervix. These blocks should also permit assessment of the ectocervical and endocervical margins. One approach is to slice the LLETZ like a ellipse of skin (bread slicing) and to embed the slices in sequence. A variant of the bread-slice method is to divide the first and last slice into cruciate slicelets in order to evaluate the margin. These slicelets can be difficult to orientate at embedding. A further technique is to dvide the LLETZ as if it was a cake being cut into slices. In each of the methods used it is vital that only one slice is embedded per cassette. The staging of cervical tumours is critically dependent on the size of the tumour and whether or not it is multifocal. If a tumour is present in more than one slice it is essential that the blocking of the slices leaves no ambiguity as to whether or not separate slices are in anatomical continuity or not. For example, suppose cassettes A1 and A2 each contain two slices. Taken in order, the slices are one, two three and four. In each cassette, one of the two slices contains tumour. This could mean that one tumour was present in slices two and three or that two separate tumour foci were located one each in slices one and four.